A couple of weeks ago, one of my professors opened class with the question, “What is the difference between eating and having a meal?” After a few minutes of discussion, the class came together and shared the fruits of their conversation and contemplation. We concluded that eating is for sustenance, while a meal is for savoring. Eating may mean passively grabbing a handful of pretzels on the way to class, while a meal implies an intentionality of compiling a plate and sitting down to consume it. Eating can be done in isolation, in a car or at a desk or in a dorm room, but meals are partaken in community. There is something more to a meal than just putting food into our bodies, there is a nourishment of soul that happens around the dinner table. Jesus knew this truth well. Just look to see how often he dines in the gospels. He gathers with his friends and with his enemies, with his apostles to whom he will entrust the Church to and with the Pharisees who will persecute him. We see him eating breakfast by the sea with his disciples, feeding the crowds that he preached to, and reclining at the table with Martha, Mary, and Lazarus. Scripture never tells us, “Then Jesus grabbed a snack from the drive-through (or whatever the ancient Israel equivalent was) and went on his way.” No, Jesus intentionally gathers to eat and often ties his teaching to his meals. He quite literally builds the Kingdom of God over suppers. This Thursday, we will celebrate the most significant meal that Jesus ever ate: the Last Supper. The last thing Christ did before entering into his passion was celebrating the Passover feast with his closest friends. As faithful Jews, he and his apostles prepared and ate the meal much as they would have every year of their lives, but at this meal, Jesus did something drastically different. In the midst of their supper, Jesus takes the bread they are sharing and says, “This is my body, given up for you.” The apostles were honestly pretty caught off guard, confused about what Christ was doing in breaking with the Passover rite. But Jesus was very clear: He is the bread of life, and this meal instituted something that would change the whole world, the Eucharist. The altar at my home parish features a scene from the Last Supper, reminding us of the transcendent meal that we join at the Mass. The Eucharist is the source and summit of our Catholic faith, the lifespring, the nourishment for all that the Church does. It is Christ made present to his Church every day, under the appearances of bread and wine. This is the most glorious earthly meal that we can ever partake in, the most intentional way that we can ever eat. But, though it is the holiest thing in the entire universe, it is only a prefigurement of the heavenly banquet that is to come. One of my favorite songs, Gone are the Days by the Gray Havens, sums this dynamic up pretty well. The artist sings: “As I reach for the bread and the wine, for the comfort I’ll find, picture the scene. One day, to the table we’ll come, every daughter and son, finally free.” The Eucharist, the bread and the wine, is our greatest consolation, our greatest comfort. And as we receive it, we join with the whole Church in heaven and on earth around the same table. The eternal banquet in heaven is the same, the place where God is calling every son and daughter to gather, finally free from sin and suffering. This song takes on a whole new dimension for eleven of my friends who are preparing to receive the Eucharist for the first time in the coming days. 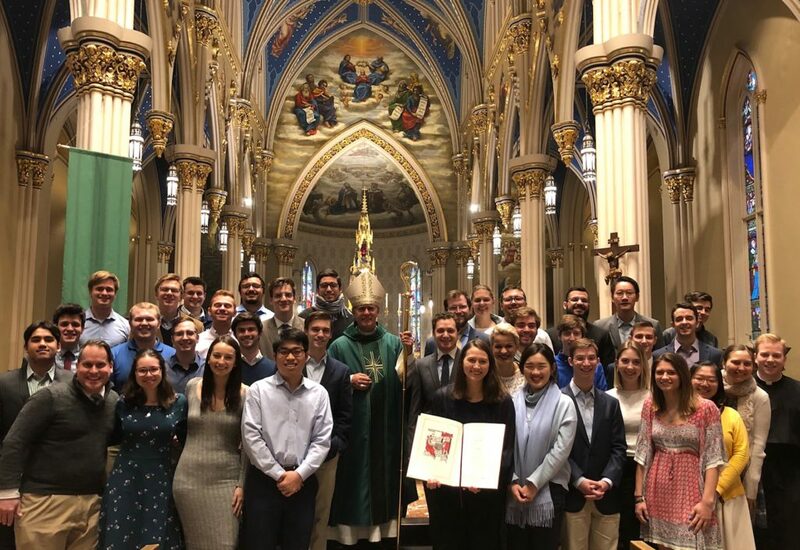 They have been preparing through the RCIA process at Notre Dame all year for these Liturgies, when they will be baptized and fully initiated into the Catholic Church. They are picturing their first Communion, where they, for the first time, will approach the Eucharistic table and share in this banquet. They will taste the goodness that the Lord offers, the foretaste of heaven, for the first time. Joining the universal human longing for heaven, they hunger and thirst for the bread of life. But so, so soon, they will get to taste it in the Blessed Sacrament. The supper that we partake in at Mass is not merely eating. It is active, it is communal, it is soul-nourishing. It points us towards the place that we were each made for, the place where there is always room at the table, heaven. Join me in prayer for the men and women who will soon join us at the Eucharistic table for the first time. 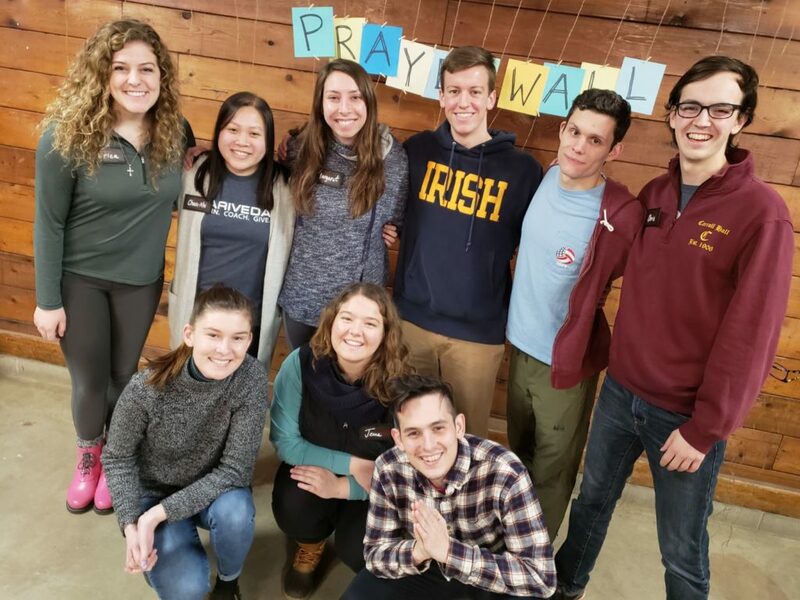 Please pray with me for Chris, Brian, Jiale, Jin, Andrew, Ricky, Zoe, Sean, Spicer, Capria, Matthew, and Justin as they prepare for the reception of the Sacraments of Initiation later this month. 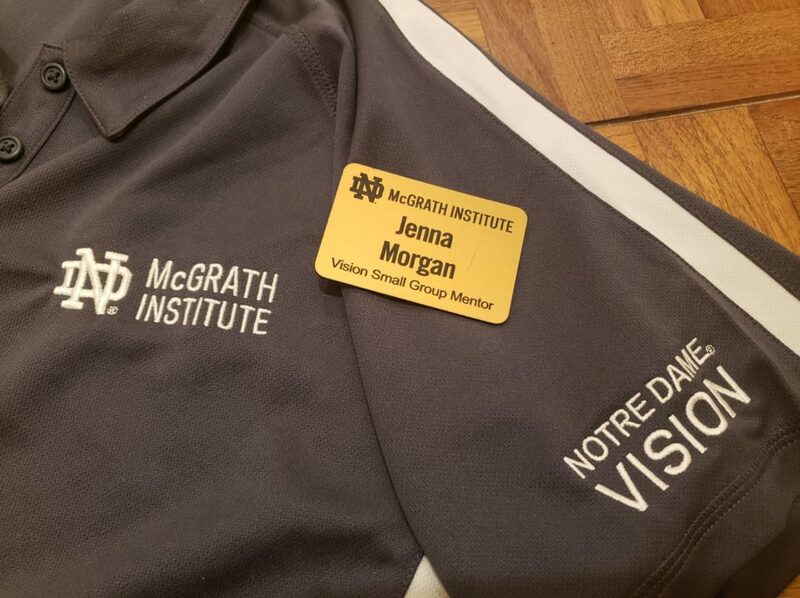 Until my sophomore year of college, I thought that to be a minister you had to have the job title and an official-looking nametag, particularly a gold one. I thought that to be a minister you had to have extensive training and some type of degree in theology, but I was wrong. Now, as an Intern for Campus Ministry, I have a new perspective on what it means to be a minister, and I’ve come to realize that though we are viewed as ministers in a more official capacity, we have actually been minsters all along, in those everyday moments. Allow me to explain. First of all, let me start by debunking the myth of the gold name tag. Yes, it is pretty cool to have one with your name on it, but they are not as substantial as they appear. They are actually made of plastic and have the potential to scratch or crack. In many instances, those wearing the gold nametags can be just as much a participant as they are a leader. 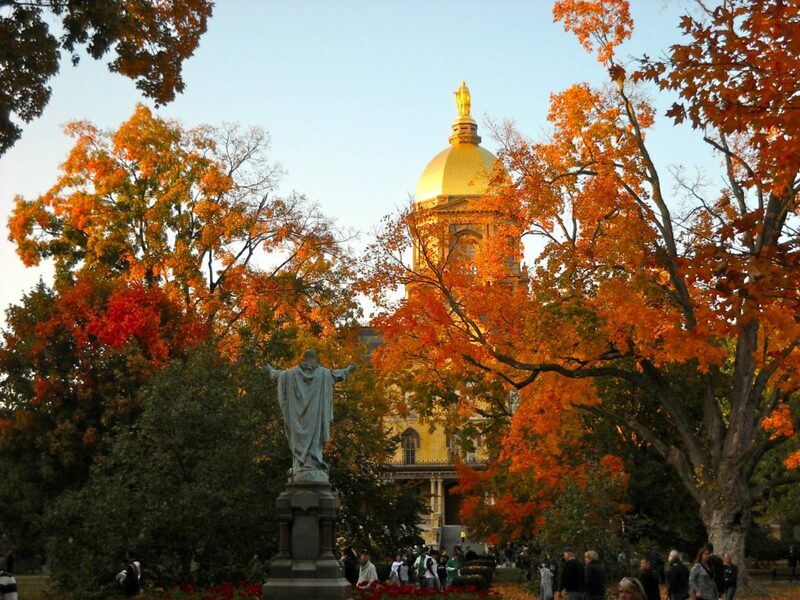 I was particularly confronted by this reality this past summer when I served as a mentor-in-faith for Notre Dame Vision. I soon discovered that though I was one of the individuals wearing a gold name tag, I was just as much a participant as everyone else. I was blessed to learn from the speakers, head staff, fellow mentors, and from the students we walked with throughout the summer. Our work did not originate from ourselves, we were simply instruments of God’s grace. I was humbled by each of the student’s thoughtful questions and responses, insights, and affirmations for one another; all they noticed, heard, and saw throughout the week. Some of the students asked questions that challenged the entire group to dig deeper and confront challenging questions and life circumstances. Second, though having the training or a degree in theology may be helpful in some situations, it is by no means necessary to have these in order to be a minister. From my understanding and experience, the only requirement to be a minister is the willingness to intentionally share life with another. With this definition in mind, what constitutes ministry and who is a minister is wide open. 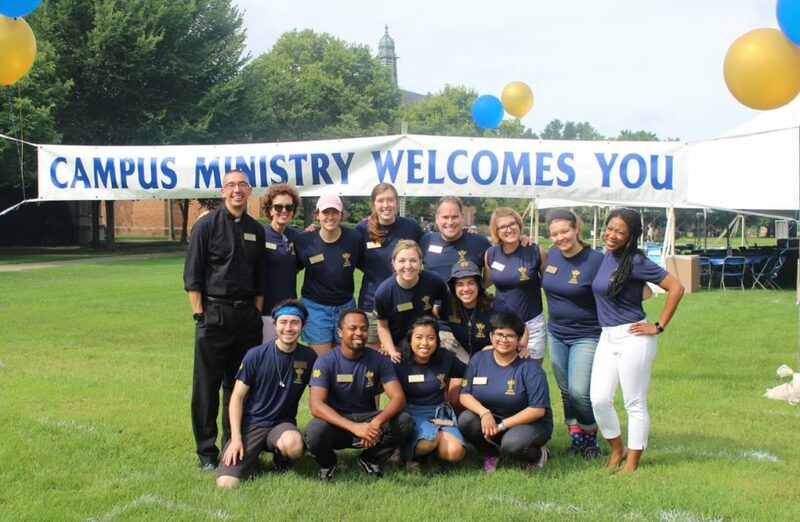 Ministry definitely includes the commonly thought of activities and roles such as creating and running a retreat, leading a small group or Bible study, serving as a lector, Eucharistic Minister, or sacristan at Mass. But ministry also includes sharing a meal with someone, talking over a cup of coffee or tea, inviting someone to go to the Grotto, a Mass, or prayer service with you, sending them a good luck text before an exam you knew they were stressing about, remembering someone on their birthday, smiling and saying “Hi” to someone on the quad, helping someone set up for a dorm event they are running, and many more moments both large and small. These are all part of what is referred to as the ministry of presence: one’s attendance to another, with or without words, to be a vehicle of God’s love. God calls us to serve, to minister. He calls us to meet others where they are at and become a part of their lives. He uses each of us and our unique gifts to hold each other up and to help each other grow in their journey with Christ. With so many different ways to minister, during this season of Lent I want to encourage you all to embrace your role as a minister. This call connects to the three elements of Lent: prayer, fasting, and almsgiving. In particular, almsgiving may be seen in the three areas of time, talent, and treasure. Therefore, almsgiving is not only about monetary contributions, but giving of ourselves through our time and talent. Look at those who surround you, and discern who you might reach out to or accompany. Deliberately plan to become a part of their lives so that you can fulfill God’s call to you, for we are all called to be ministers. Most of my friends would not hesitate to describe me as an indecisive person. I’ve been known to spend weeks, months, or longer!, agonizing over a looming decision, flip-flopping between alternative plans of action, and filling up journal pages with lists of pros and cons or whiney complaints about the decision that lies before me. And usually even after some sort of decision is reached, my thoughts and prayer become flooded with a tangled knot of doubts and regrets. After I began to notice this cyclical pattern within my decision making, I became more attentive to my prayer as I struggled to make decisions. My default in prayer had developed into a familiar scene in Adoration. Kneeling in silence in front of Jesus, I would pray for an open heart to listen to where the Lord was leading me: “Alright Jesus, I’m ready to listen to what You want me to do. 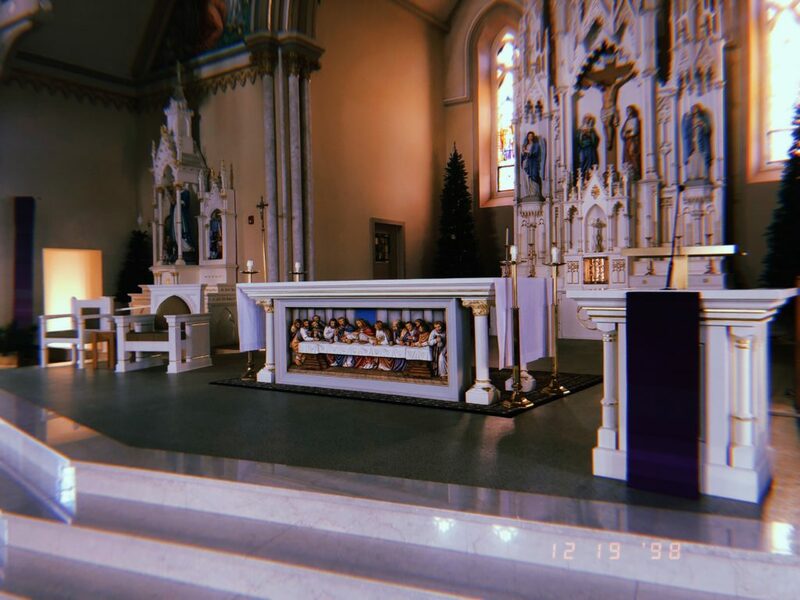 So tell me what to do now please and thank you!” Unfortunately, I would usually leave the Adoration chapel more confused or discouraged after my desperate prayers. My “miraculous voice in Adoration” plan had fallen through more times than I’d care to admit. I felt that God wasn’t answering my prayers and that any sort of decision placed in my path had become a puzzle that He wouldn’t help me solve. If I wanted to carry out God’s will and do what He wanted me to do, why couldn’t He just make it a little easier for me to do so by showing me the right path? My indecisiveness also stemmed from a place of deep mistrust of myself and my own decision-making faculties. Time and time again I was so afraid of making the wrong decision that I found myself paralyzed in fear, stuck in a state of limbo or of inaction among the options that I was considering. Instead of thinking of my free will as a gift, I viewed it as a burden or an obstacle in my relationship with God. I realized that what I really wanted was for God to make all of my decisions for me and that in doing so I had put Him in a box. I wanted definitive answers, to know where I was going, and I wanted to hear God say it. I wanted to experience and hear God in my terms and in my way. I was not being open to how He wanted to speak to me or reveal Himself to me. In 1 Kings 19, we read the story of the prophet Elijah, who ascends a mountain in order to find the Lord. He experiences the passing of a strong wind, an earthquake, and blazing fire. Elijah is seeking the Lord, but the Lord is not in the wind, earthquake, or fire. It is only afterward when the Lord reveals Himself to Elijah through “a light silent sound.” God reveals Himself not through thunderous natural phenomena, but instead in a quiet whisper. There was a strong and violent wind rending the mountains and crushing rocks before the Lord–but the Lord was not in the wind; after the wind, an earthquake–but the Lord was not in the earthquake; after the earthquake, fire–but the Lord was not in the fire; after the fire, a light silent sound. (1 Kings 19:12-13). However tempting it might be, God doesn’t want us to test Him or beg for a miraculous sign or response when we are making decisions. God doesn’t always work like that. A lot of times, He is in the small whisper calling us to trust Him in faith even when we don’t know where the path ahead of us may lead. In fact, the Lord may work through the journey of increased faith and trust in choosing to walk alongside Him amidst uncertainty and fear. God calls us to greater trust in Him and His plan through the actual process of decision making and in wrestling with our options and all the while seeking Him. In the paralyzing unknown that accompanies difficult decision making, worrying is a natural response which in reality leads us nowhere. Our Lord, who is ever-faithful and unchanging, promises us true peace when we put our faith in Him. Instead of worrying, He calls us to cast all of our worries upon Him (1 Peter 5:7). When the decision in front of us is challenging or when God doesn’t seem to give us an easy answer, we can allow the experience to be an opportunity to deepen our faith instead of doubting His goodness or His plan for us. And especially when discerning between two goods, we can remain faithful that God will be with us no matter what we decide. We can choose to see the decision as a blessing instead of a burden, and in all circumstances give thanks for how the Lord works in our lives (1 Thessalonians 5:18). God will never fail us, even amidst anxiety, doubt, fear, or worry that may accompany decision making. As our faith is challenged in periods of uncertainty, we are called to grow in trust of God’s accompaniment and to grow in receptivity of how He is calling out to us, even if it’s not how we’d expect. In this time of Valentine’s festivities, there is always a multiplicity of commercials advertising rings and ‘I do’ moments, so I wanted to take the time to share my own ‘I do’ moment. This summer in front of a church full of family, I said the words many dream of saying: ‘I do’. No, I am not talking about a wedding, but the Baptism of my godson. I had the great privilege of becoming a godparent this summer and thus had the opportunity to respond ‘I do’ for my godson, Wyatt, during the renunciation of sin and profession of faith. In this part of the rite of Baptism, before the baby is baptized, the godparents and parents respond ‘I do’ to a series of statements of beliefs on behalf of the infant until they can confirm it themselves as an adult. If the person being baptized is an adult they themselves respond ‘I do’. These statements are heard at different points in the liturgical year as well, such as Easter or the Mass celebrating the Baptism of the Lord, where the congregation is invited to renew their Baptismal promises with an ‘I do’, though this time not necessarily in a white garment. 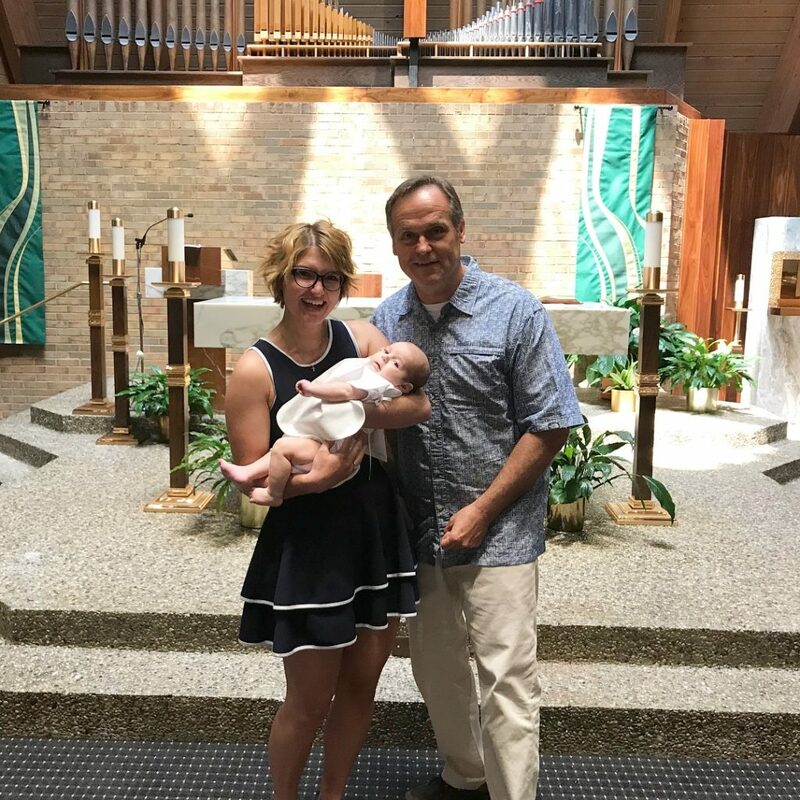 Since Wyatt’s Baptism this summer, I have been more aware of the actions in the sacrament of Baptism as I found myself an active participant in a new way. It is a sacrament that occurs fairly frequently within my home parish, as babies are baptized during the regular Mass times and paraded around the entire church to be fully welcomed by the congregation. This has allowed me to continue to say ‘I do’ alongside the parents and godparents, renewing my Baptismal promises throughout the year. In doing so frequently, I have had the time to reflect on the importance of the words to a greater extent. I have long considered ‘I do’ to be the centerpiece of the wedding ceremony, whether religious or not, and had only considered the words to be an affirmation of the bond formed between the two individuals. However, as I have come to see the words ‘I do’ in many other contexts of the Catholic sacramental life, I am more aware of the reality that the ‘I do’ is not simply between the two individuals, but also with God through the seal of the Holy Spirit. This ‘I do’ is also a continuation of the ‘I do’ of Baptism, the sacrament in which we are “clothed with the wedding garment” (CCC 1244). Baptism is the “gateway to the Spirit” (CCC 1214) and then “in the epiclesis [the invocation of the Holy Spirit] of this sacrament [of Matrimony] the spouses receive the Holy Spirit as the communion of love of Christ and the Church. The Holy Spirit is the seal of their covenant” (CCC 1624). Besides my own Baptism, I have also been dressed in white and said ‘I do [believe]’ in front of family and friends in another sacrament: my First Communion. Before receiving the Body or Blood of Christ during the Eucharist, the recipient responds with ‘Amen’, a word that states a confirmation of belief, in essence an ‘I do [believe]’. 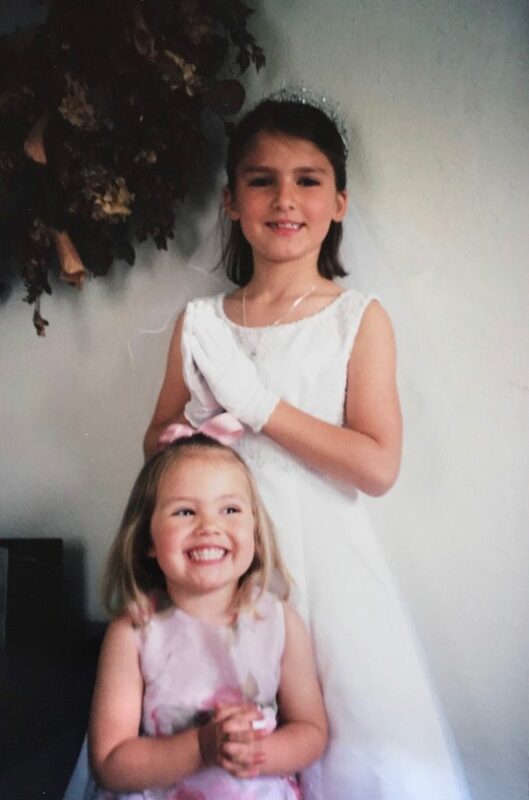 The first time this is said, girls are often in a white dress, and I even wore the veil that my mom had worn during her wedding and the cross necklace my grandmother had worn at hers. We are invited to say ‘I do’ at every Mass after this momentous occasion, even when we are not in white. Although I had known that Matrimony was sacramental, as there is a non-religious version of the rite, its sacramentality has not been as apparent to me as that of Baptism or the Eucharist. In researching more about the connections between the three, I read a passage from the Catechism of the Catholic Church that describes how these three sacraments are interconnected. In this, the richness of the sacrament of Matrimony and its signs has become more apparent to me. The passage states: “The entire Christian life bears the mark of the spousal love of Christ and the Church. Already Baptism, the entry into the People of God, is a nuptial mystery; it is so to speak the nuptial bath which precedes the wedding feast, the Eucharist. Christian marriage in its turn becomes an efficacious sign, the sacrament of the covenant of Christ and the Church” (CCC 1617). The idea of a nuptial bath and the connection between Baptism and Matrimony can also be seen in Ephesians 5: 25-27 which states: “Husbands, love your wives, as Christ loved the church and gave himself up for her, that he might sanctify her, having cleansed her by the washing of water with the word, that he might present the church to himself in splendor, without spot or wrinkle or any such thing, that she might be holy and without blemish”. In this, Paul “teaches that baptism makes the Christian husband and wife members in the body of Christ… They have already been received into the mysterious union of Christ with His Church. As members of the bride of Christ they themselves are wedded to Christ; hence the mystery of the union of Christ and the Church is found in them also” (Scheeben 602). The Catechism states furthermore that “the celebration of marriage between two Catholic faithful normally takes place during Holy Mass, because of the connection of all the sacraments with the Paschal mystery of Christ” (CCC 1621). The celebration of Matrimony within the context of Holy Mass is an element that I have often taken for granted, and sometimes considered unnecessary; however, it is a beautiful idea to me now that the first ‘feast’ that a newly married couple shares together is not the reception dinner, but the Eucharist, and that the white dress recalls the white garment received in Baptism. I am sure I am only beginning to scratch the surface of the depths and interconnectedness of these three sacraments. That is perhaps the most beautiful thing of all, though; that these sacraments’ intricate mysteries will continue to unfold across my whole life, allowing me to continue to say ‘I do’. Catholic Church. Catechism of the Catholic Church. 2nd ed. Vatican: Libreria Editrice Vaticana, 2012. Print. Scheeben, Matthais Joseph. The Mysteries of Christianity. Translated by: Cyril Vollert, S.J., B. Herder Book Co., 1951. 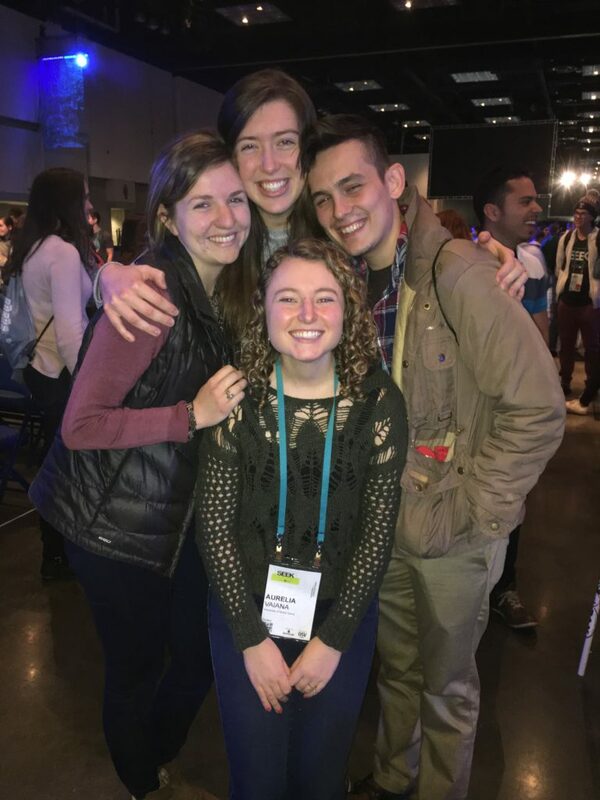 A few weeks ago I attended the Catholic young adult conference SEEK with 17,000 other people. During the conference, the Church celebrated the feast of the Epiphany, the time to—like the three kings—pay homage to the newborn King. Each year around the Epiphany I find myself pondering the gifts of the three kings. In some ways I am awed by the quality and richness of these three gifts of gold, frankincense and myrrh. I imagine the sincerity with which the kings lay the gold, frankincense and myrrh at the foot of the manger and I know that God receives their homage. Yet, in other ways, those gifts seem so insignificant. No amount of gold, frankincense and myrrh, despite quality or cost, could possibly give fitting homage to the King of Kings. When I think about the insignificance of even the costly gifts of the kings, I realize that I will never have a gift worthy of my King. Consoling myself, though, I breathe a sigh of relief, falling back on the knowledge that God has things under control. My lack of a gift doesn’t change the fact that He’s God, I tell myself. Yet, this Epiphany, I cannot shake the feeling that Jesus wants me to offer him my own personal gifts. The three kings brought gold, frankincense and myrrh, but now Jesus asks me for a different kind of gift: He desires joy, obedience, sacrifice, perseverance, trust, praise, patience, charity, and really all of the virtues. As I think about which gifts Jesus wants me to offer Him specifically, I deflate inside, knowing that what Jesus desires from me personally is not packaged up nicely like a treasure box of gold or a gilded canister of frankincense. Not at all. My trust, my praise, and my perseverance are quite fleeting and sometimes nonexistent. So, why would God continue to ask for them anyway? How could my attempts at perseverance be the gold that He accepts as homage? Well, as SEEK reminded me, God doesn’t understand gifts in the same way that I do. He understands gifts through Himself: He understands the power of sharing. 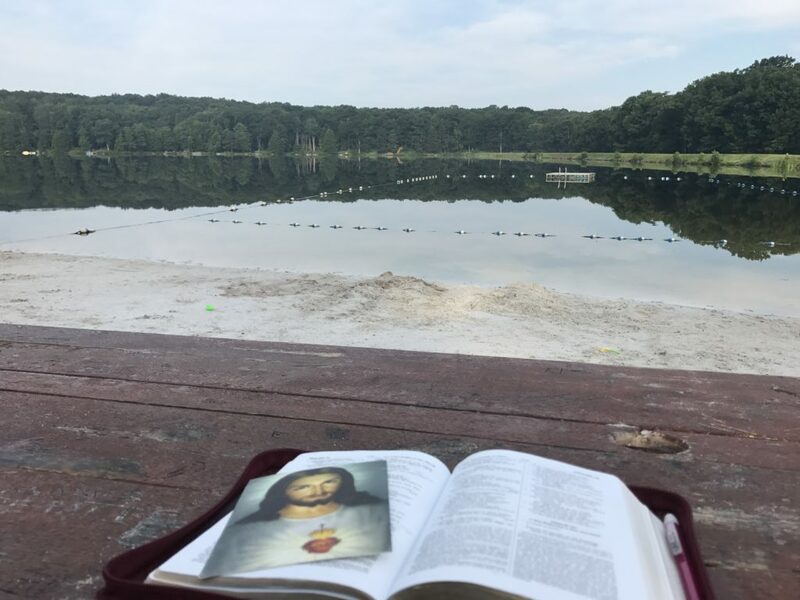 For the first few days of SEEK I found myself listening to talks, going to mass, and experiencing so many things that continually reminded me of the beautiful truths of God’s relationship to me and to every person. Though surrounded by 17,000 other people, listening to the same talks and attending the same masses, instead of rejoicing in God’s presence among us, I kept what I was hearing and experiencing to myself. 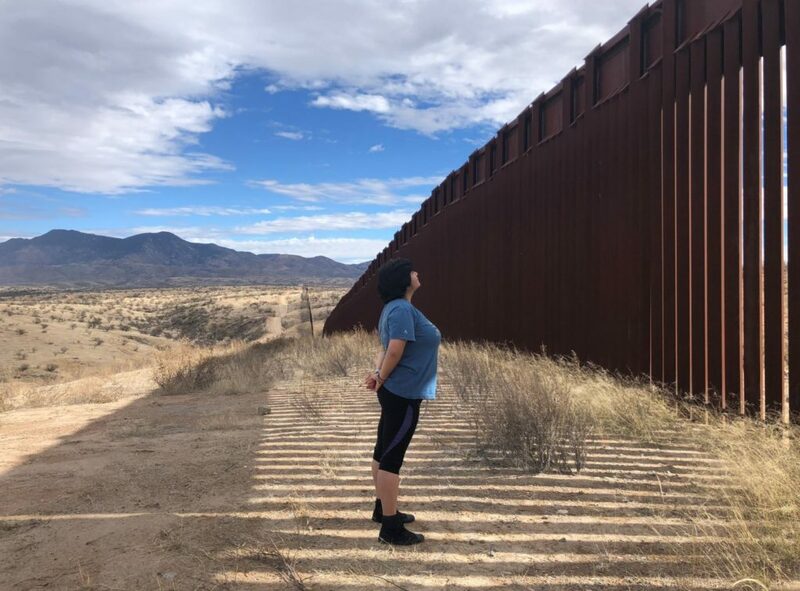 Conversations about the talks elicited many “good,” “great,” and “funny” responses or objective summaries, but I didn’t want to share anything else—anything personal, vulnerable or spirit-filled. I acted as if I could keep God to myself, but God cannot be contained. Trying to isolate myself with Him really meant isolating myself from Him. Purely out of practicality but quite ironically given my current state, I decided to attend a talk about praying with others. As the priest giving the talk began to explain the power of the Holy Spirit when two or more are gathered in Christ’s name (Matthew 18:20), my heart also began to come alive. I suddenly knew that the active love of the Holy Spirit that the priest invited us to recognize and call upon specifically in community is the true reality of God. Rather than my closed-fisted approach, it became utterly clear that God manifests Himself through the out-pouring love of the Holy Spirit which is always a shared and fruitful love. As I left the talk and gathered with a few other students from our group, I now couldn’t help but excitedly share what I had learned. As I shared, I could feel the presence of God enlarging my heart and my ability to receive God and perceive Him in others. We ended that small gathering by praying together over one of the girls and invoking the Holy Spirit to pour out His love upon her. Simply our union in doing so was a witness to the reality of the Love that filled the space. Beginning this new semester and new year after SEEK, I am finally beginning to understand what it means to lay a gift at the manger each day. Not in my economy of gift, but rather God’s economy, sharing myself, my gifts, or maybe simply my desire for God becomes not merely “enough,” but the basis for an active relationship with the Lord. By themselves, the little gifts that I seek to lay before the Lord will be puny and insignificant. When shared, however, they acquire the utmost value and purpose for Christ. For Christ does not work in our perfection, but in our openness to His presence being manifested in and through us and in and through others. Gifts like trust, praise, and patience cannot even exist on their own. They rely on a relationship with God for existence and will become treasured gifts not because I will have given them to God, but more truly because I will have received them from Him. Our gifts or virtues, in the end, will not be about us, but rather the manifestation of our receptivity of the greatest treasure: the King Himself. As we seek to share ourselves, our gifts, and our time this semester, let us remember that God manifests Himself in our sharing. This is why it is sharing and not simply giving. What we give does not leave us. It is realized and then magnified, becoming a part of us because it is God Himself entering in. It is the merciful Father gazing at us just as He gazes at the person we have just acted mercifully towards; it is Jesus waiting patiently for us just as He comforts the person that we have chosen to truly listen to; it is the Holy Spirit enlivening our hearts with joy just as He does to the person that we have just smiled at. Christ is never lost when we give Him to others, but always multiplied. We can thank Him that our little gifts, when shared, become great means not only of letting His radiance touch the lives of others. In doing so, we allow Christ to be present and magnified in our own hearts. The holiday season is officially upon us. Thanksgiving has passed and Advent is here, which, for many of us, means there is a myriad of gatherings to plan and guests to host during the coming weeks. Families stay overnight in our homes for the holidays, co-workers and friends gather for Christmas parties, carolers are invited inside for hot chocolate or cookies. When we are expecting guests, it can be all too easy to get so caught up in the tasks of being a host or hostess that we forget what it means to be hospitable. 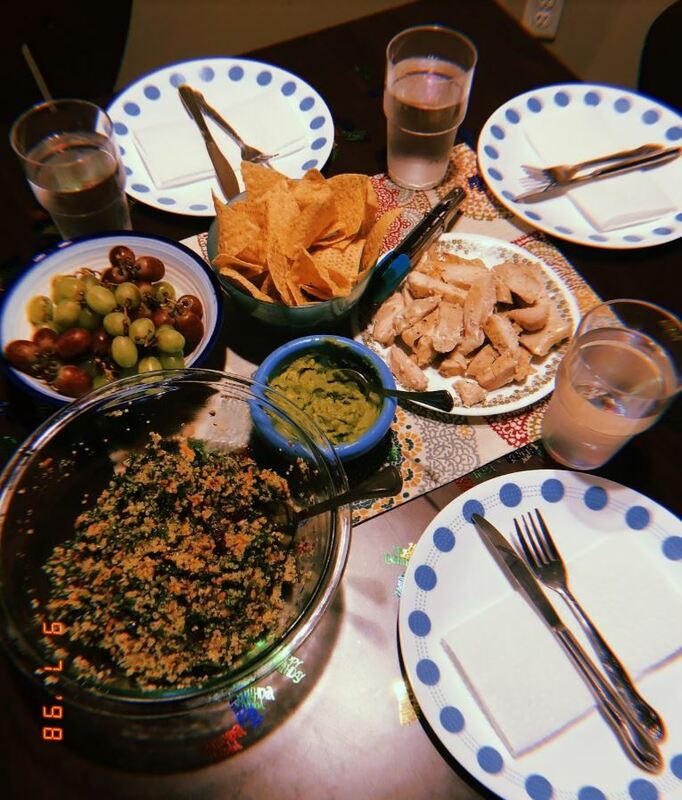 This semester, as I’ve prepared for my own guests to visit my apartment, I’ve often found myself agonizing over what recipe to cook or how to arrange the snack table or what songs to add to the playlist. I’m tempted with perfectionism and pride, becoming more concerned with how my friends perceive me and my domestic skills than how well they are loved when in my home. Intuitively, I know that having an instagram-worthy spread and picture-perfect decor isn’t what hospitality is about, but I’ve struggled to figure out what it truly means. Some insight from the practices of St. Benedict has helped. The Benedictine order, the group of monks that St. Benedict founded, is known for their hospitality. This is a pretty wild idea. Think about it: an order of monks, vowed to a life of poverty and prayer, probably living in a remote monastery, are notoriously good hosts. By the world’s definitions of being the ‘hostess with the mostest,’ this makes no sense. They don’t have elaborate decor for every season or the trendiest snack choice for every dietary need. They are men of simplicity, not of extravagance. So what makes them such great hosts? The Benedictines are noteworthy hosts because they receive each person who enters their monastery as Jesus Christ himself. They hope to make their home a place of welcome, where guests’ hungry hearts can be nourished. Inviting people in, the Benedictines say, “I see you. I love you. I want to get to know you.” In this gesture, they speak to one of the deepest longings of the human heart, to belong. This is truly what makes the Benedictines some of the best hosts in the world. They understand that hospitality is not about doing but about being. It is not a task to accomplish but a disposition to embody. Praying with this idea has transformed my ideas of what it means to be a hostess, and I hope that this new attitude translates into how I welcome my friends and family this season. If we want to receive our visitors as Christ did, we must welcome Him first! Let’s open our own hearts to Jesus. Let’s ask him to join our preparations and our parties. Let’s call upon him to send his graces upon our gatherings and reveal himself to us in our neighbors. If we desire to encounter our guests, we must make sure that our homes are conducive to encounter! Let’s worry less about planning activities and more about encouraging conversation. Let’s ask good questions and listen intently to their answers. Let’s introduce guests to one another and to God. If we hope that each person who enters our home feels loved, we must love them intentionally! Let’s greet each guest joyfully and by name. Let’s be truly glad that each and every person is with us. Let’s delight in the presence of our friends. There’s really nothing difficult about being a host or hostess like the Benedictines. It doesn’t require any custom-ordered cakes or personalized napkins. It simply requires a gift of ourselves. I pray that you can join me in making that gift to your guests this season. At times, an image comes to mind. An image I saw some years ago that depicted a man walking. While walking, he was hit in the head with a stone. After being smitten, he turned around both hurt and angry and screamed “Why God? Why? !” At that moment, he looked up and saw God shielding him from a conglomerate of boulders. 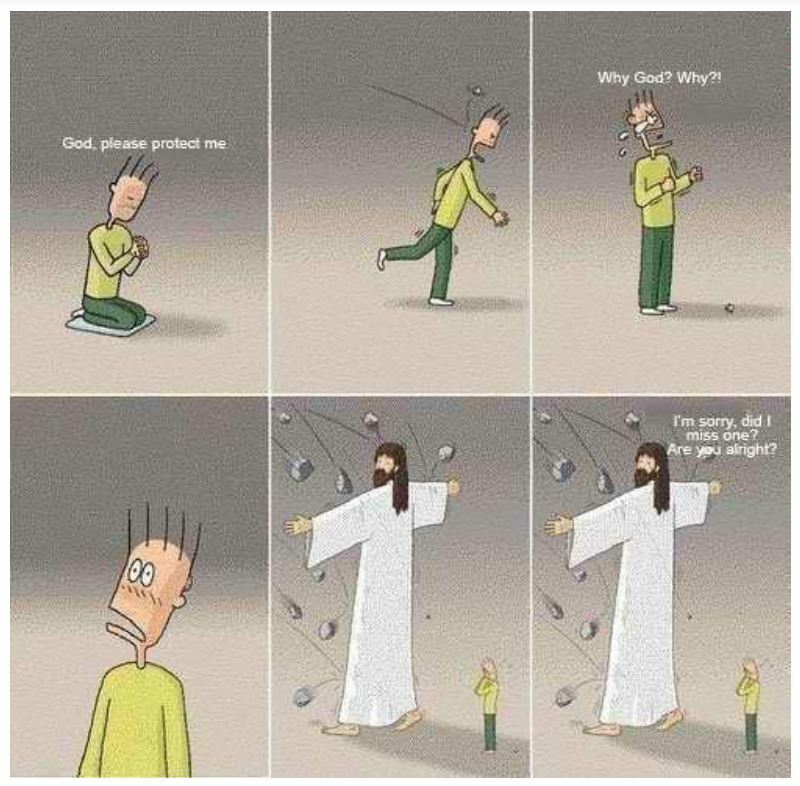 God then looks back and says “I’m sorry, did I miss one? Are you alright?” Although this image itself shows doubt, that isn’t what spoke to me about the picture. Have you ever heard God described as your “friend,” your “father,” your “rock,” or another familiar term? Often we view God as a father that watches over us or a friend who we can trust and confide in fully…. Well, I have definitely had points in my life where I wanted to challenge this idea. “How can I confide in God as a friend, if he already knows everything that I have done, will do and simply thought of doing?” and “If he truly is my heavenly father, doesn’t he want what’s best for me? Why does he keep letting all of these things happen to me? Why does he let me fall? Does he care enough about me to intervene? Where is he when I need him?” and “How can he be my rock and my fortress when he allows so much evil to come into my life and knock me off balance?” These are honest questions that I’ve had in my faith. Maybe you have asked similar questions that challenged the commonly given praises that God receives. Whenever I asked these questions, I would always find myself running far away from God. I would run as far as I could, doing whatever I wanted and surrendering myself to the forces of the world instead of his will. Through these questions, I experienced doubt in the power of God. Growing up, I was constantly taught in church to never doubt God, his love, and his power over everything. I was taught that this doubt meant that I did not trust God and that even if I did not understand him or his ways, I was to follow after him in ignorance if necessary. It wasn’t until college where I learned how healthy doubt truly is. Through doubt, we are truly able to grow closer to God. Through these questions, I have been able to see that I can confide in God as a friend because when I honestly have no one else to talk to, I can talk to him. And he does want what is best for me, even when what I think is best for me doesn’t exactly line up with God’s will. The pebbles that escape his impenetrable fortress were meant to make me tougher. He allows these hard, rough-edged trials to come into my life to make me better than I was before. They are meant to teach me new lessons. Lessons of humility, of conviction, of pain, of loss, of strength, of patience, and of love. It is honestly these moments where we have been stricken and have run so far away from God, that we are honestly the closest to him. In these points of weakness and vulnerability, I have grown to depend on his strength to get me through the trials. It is through these times that I have felt the most alone that I could call on his name and he is present for me. I initially think that because he allowed that one stone to hit me, I was running further and further away from him, but in all actuality, I just ended up running right back to him. I may not have gotten everything I wanted in life or had the easiest 21 years of living, but he gave me everything I needed. Who am I to say that he hasn’t? I’m alive, aren’t I? All my needs are met, aren’t they? And he still loves me unconditionally…and there’s no need to question that. He has truly been the best friend I’ve ever had, even when I felt that I had none. He has been the only father that I have truly known throughout my whole life. He is the rock that keeps me grounded and the fortress that keeps me safe. I think that now I understand that when those stones make it to me and knock me off of my feet, that it was his doing and it isn’t a deficiency of his power, but a flex of his strength that he wants to instill in me. I’m not saying that I won’t try to run away in the future, but at least now I know that eventually, I will run right back into him. Looking back at the past two years, the journey of the end of my father’s life, I cannot believe how much God has blessed me with. I recognize that in the beginning of the journey, my faith and trust in the Lord was not as strong as it has become. I’ve learned to listen, pay attention, and honor what is valuable day-to-day. During the fall of my third year, my father began acting in a strange manner and no one knew the cause of it. His actions lead to mistrust and a rocky relationship with my mother. In order to help them, when I came home for Christmas break, my family prayed a novena to Our Lady Undoer of Knots. On the seventh day we were unable to enter into the chapel where we had been praying the novena. So, we prayed in the van. As we finished, my mom saw the parish priest heading to the chapel and she followed him. My mom began to tell him what had been going on with my dad; the mood swings, the sleeping, and the exhaustion. The priest’s suggestion was to take my dad to urgent care. Odd suggestion. My mom comes back into the van and asks me, “Should we go get groceries as planned or should we go to urgent care?” I responded to her that he was fine and we should just go get groceries. She did what her gut was leading her to do and we went to urgent care. During this time, I had trust that the Lord would help my parents and mend their relationship. Although I had faith in this, I was not listening to where the Lord was asking my mom and I to go. To trust in the signs and pay attention to what was truly important. At urgent care, the doctor saw the same thing that I did, there was nothing wrong with my dad. My mom noticed that half of his face was droopy. Once she pointed this out, I began noticing it as well. Once the doctor could see it, too, he said that we needed to go to the emergency room because my father could potentially have had a stroke. I had never experienced how overwhelming it is to enter the hospital off of an ambulance. There was so much going on at once that I didn’t know where to focus my attention. Everyone was speaking at once; nurses from the ambulance and those with my dad were asking questions, the social worker as well, and my dad who had no idea what was going on. I was answering their questions, translating for my dad, and looking to see where my mom was. Once things finally calmed down, my mom and I were moved into the waiting room. In this overwhelming and confusing moment I recognized how God allowed me to have peace and clarity in the moments I needed to respond. My dad went in for a CT scan and an MRI, but with it being so late at night we had to wait until morning for the results. On Christmas Eve, I remember walking into the hospital room where the doctor told us the MRI showed that my dad had two tumors in his brain. This shattered my heart. My dad had two tumors in his brain. This explains the sleeping, the anger, and the reason why he wasn’t himself. This was day eight of the novena to Our Lady Undoer of Knots. 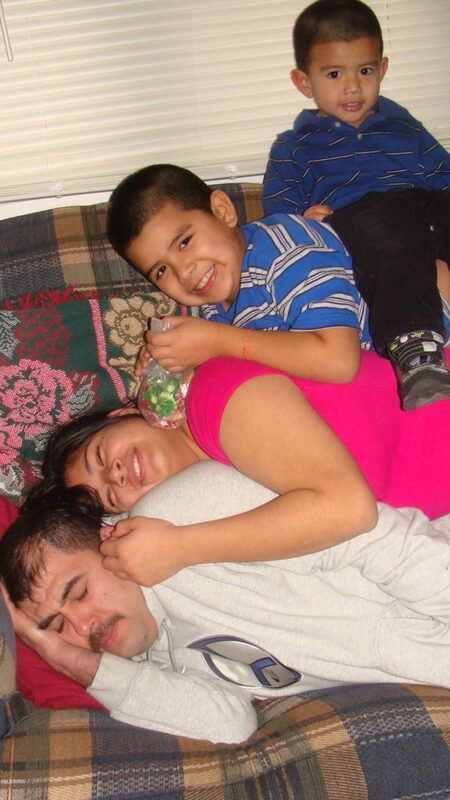 The next hour, day, weeks, months, were some of the most difficult, but best times I had with my family. My father went through chemotherapy. He was doing really well at first, but then the treatments were no longer affecting the tumor. After the chemotherapy, he went in for radiation. Throughout these treatments I was on call. At any moment a call from my family could come in and I would answer. Mainly to translate, but at times it would be my father who had nothing to do in the hospital but wait, so he wanted to talk. I remember sitting outside my classes in tears because I couldn’t be beside him during those times. God had placed me where I needed to be throughout this entire journey. The more I listened to the Lord in prayer it became more clear as to what I needed to do. As the following school year was starting up we received news that the radiation was not working and the tumor was growing. I returned home for the following appointments. I remember being in the hospital and there wasn’t a translator present. The doctor told us that my father had at most three months to live. I then, without thinking too much of what the doctor had just said, translated to my family in Spanish. I will never forget the moment my mom turned to me hoping that she had heard the doctor incorrectly and then telling her that what she heard was correct. For the next couple of months my family did anything my dad wanted. 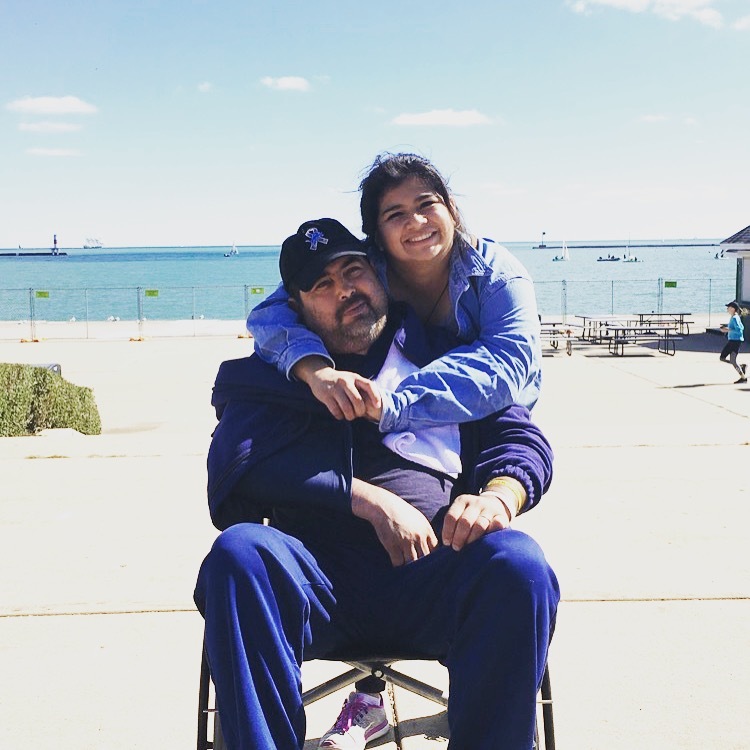 We went to Chicago for a weekend, my parents renewed their 25th anniversary vows, and there was a lot of ice cream that was eaten. These memories are so wonderful and full of love, joy, and hope. I was sitting in office hours when I received a call that my dad was getting worse as the day progressed. This was the last time I heard his voice. I remember speaking to a family friend who was taking care of him and she asked me, “When are you coming home?” I told her that my plan was to leave the next morning because I had to work that night. Then the follow up question of “How early?” I told her I could leave in that moment if I needed to – so I did. Let me tell you how wild and full of the Holy Spirit these next moments were. I got off the phone, headed to let my professor know that I was heading home and was probably not going to submit the assignment on time. I text my friend to see if I could potentially borrow her car in that moment and she said she had just arrived back to campus and would meet up with me to give me the key. Obviously not being in the perfect mindset to drive, I called a good friend to see if he would drive me home. No answer. I text him that I would be heading home because my dad isn’t doing well. Luckily, he steps out of class and said he would meet up with me to drive me home. All of this happened within 5 to 10 minutes of deciding that I needed to leave immediately. The Holy Spirit was incredibly present and I calmed down as everything fell into place. I made it home in time to be with my father for a couple more hours. 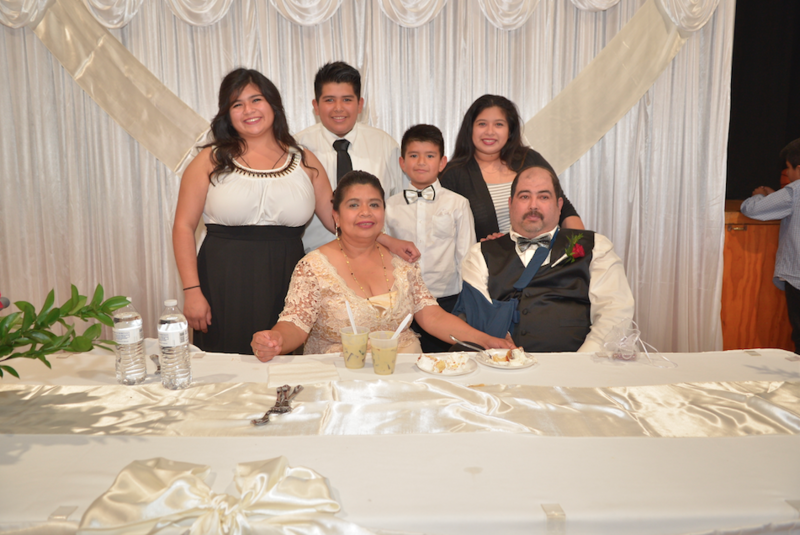 I am so grateful that my family was able to be there. Even in those last moments, God allowed my youngest brother to fall asleep as my dad was taking his last breath. Through this journey I have been able to grow in my relationship with God and to recognize my encounters with Him . God is present every single moment, every single day. Know that God is with you when your world or heart shatters and He will never leave your side. Descanse en paz papá. In loving memory of Francisco Javier Toledo. As the days grow shorter and I begin to pull out my boots and scarves on these late fall days, I feel my whole approach to the semester shifting. Anticipation for home—for Thanksgiving with family and Christmas in Minnesota—has set in. At the same time, almost as if these holidays are the winter hibernation that ensue fall semester, I find myself frantically trying to prepare for and accomplish all that must happen between now and Christmas break. I mean, suddenly I feel a surprising association with our squirrel friends trying to fatten up for winter as I wonder if I’ll have enough flex points to see me through another month of research papers and tests! Needless to say, I find my thoughts and life patterns becoming more and more narrowly focused and closing in upon themselves—really, patterns of survival in the chaos. The endless to-do lists that threaten to overwhelm my thoughts during Mass or prayer, the reminders from friends that I’ve forgotten to spend time with them, or the lack of wonder at the glories of burning fall foliage as I hurriedly traverse campus speak to the all-consuming nature of this mentality. What I myself need to do for me becomes the mantra. But, with this mindset, I know I am closing off what is most important. Where is the space to hear God speak? To recognize His presence in another? To receive and share His Goodness? 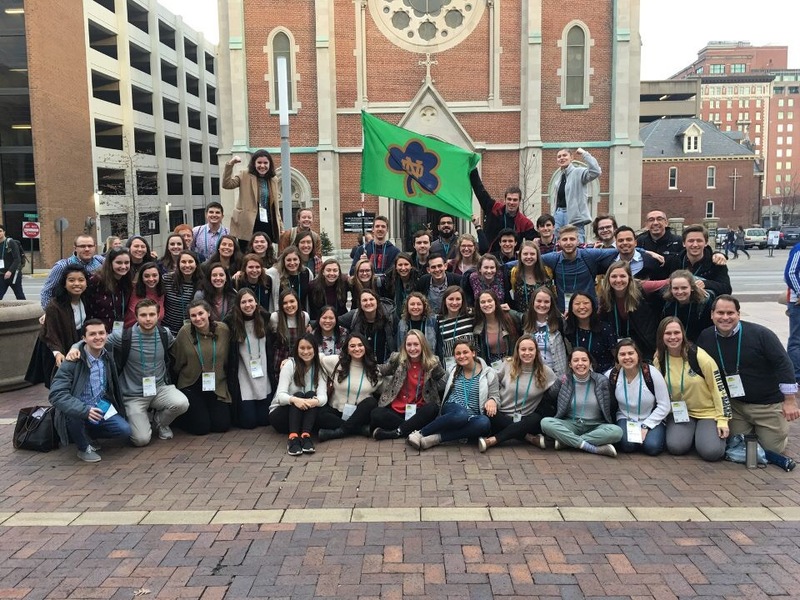 In the midst of this hibernation preparation, if not for the questions from friends and acquaintances across campus about my fall break, I might have easily forgotten that only two weeks ago I was on pilgrimage in Rome during the Synod on Young People, the Faith and Vocational Discernment. 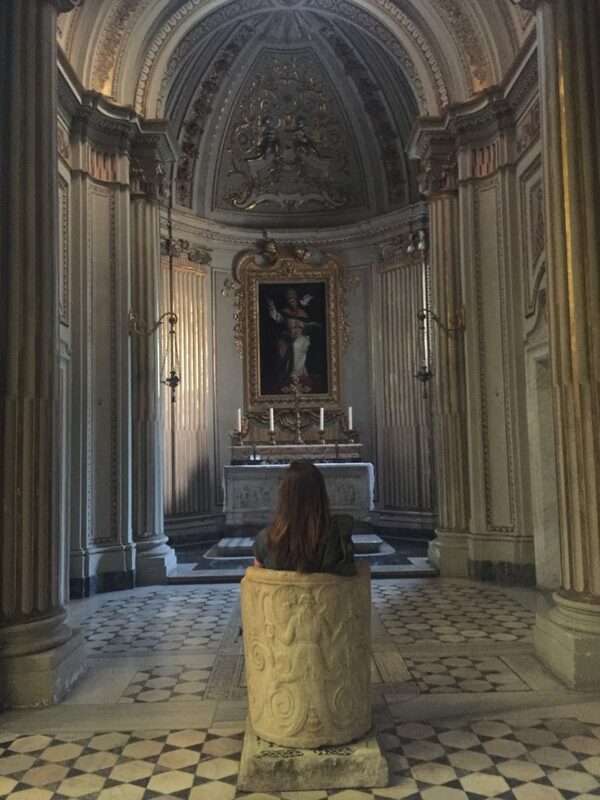 With a dozen other Notre Dame students I had the privilege of experiencing the Church through the beauty of Rome’s churches, art, and legacy of the saints and opening myself up to the broader reality of the universal Church. “Immediately upon arriving in Kolkata to serve with the Missionaries of Charity, Mother Teresa’s order of sisters, immense suffering and destitution confronted me. I cried out to God, “Where is the goodness here? Where is Your joy?” The suffering around me seemed devoid of life and hope. Yet, when I wanted to run, I found Jesus waiting, asking me to enter into this poverty—and not only another’s poverty, but my own. The call to rest in Christ’s poverty became a continual ache inside of me—one of both longing and utter loathing. I wanted to see the goodness in his poverty, but it hurt. I knew it meant letting my own heart be broken up, just like the women and children whom I served. Would I let my heart be broken to see His Goodness? That’s what Mother Teresa proposed, but I didn’t necessarily want to listen. Before Kolkata, I thought Mother Teresa and I were friends. In Kolkata, I just felt like she was picking on me the whole time. Her words about sacrifice and her example of poverty are beautiful but living them out proved far more difficult than I expected. If I wanted to respond to them, I had to change. Yet, she invited me to sit at the foot of the Cross—in prayer and through being with the women and children in their suffering—and hear Jesus’s call of “I thirst.” In doing so I began to learn to turn into the depths of poverty of both the women and children I served, and of myself—and really of Christ. This felt like throwing all caution and safety to the winds, but Jesus showed me that His goodness isn’t my own control of safety or my own desire for comfort. Goodness is not safe as I know it, but it is the surety of Christ’s protective arms stretched out on the Cross for me and for all of us: it is His sacrificial love. In these final weeks of the semester, I often forget that Christ calls me to be close to Him first. I forget that this closeness to Christ paradoxically entails not a closed off, self-preserving attitude, but an openness to the greater reality of a life beyond myself and my seemingly pressing needs. Kolkata and Rome remind me of what is important and also call me to examine how I am overlooking this importance in my daily life. I really don’t need to look far to realize how I can enter into relationship with Christ and others now. All it takes is simply looking up and looking out to receive friends and classmates in their own struggles and joys, to be grateful for leafy reflections on the lakes, and to remember that God wants to meet me in prayer and the sacraments now, not in December when hibernation preparations have ended. Ultimately, I know, trying to make it to the end of the semester unscathed, complete, and well-preserved through keeping my tunnel vision in place will not lead to a place of light, life and wholeness. As Kolkata revealed to me, our hearts don’t work like that. Rather, precisely in the small sacrifices of being present to the people around us and in recognizing the goodness of our time right here and now, even when chaotic, will our daily struggles be transformed into a beautiful journey with Christ.